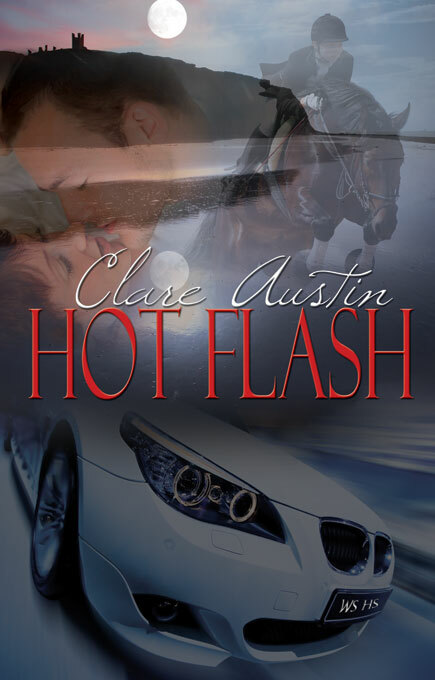 The hero in my novel Hot Flash is Bran Sullivan. He’s Irish, wears his emotions shamelessly and is demonstrably affectionate to family and friends. He’s often inclined to give a hug and kiss on the cheek. He’s a man who loves being in love. Kate, whom Bran insists on calling Katie, is facing her fiftieth birthday, suffering hormonal hot flashes and has recently been ingloriously dumped by her philandering husband. To discourage her mother from “fixing her up” with a distant cousin, Kate lies and claims she is engaged to Bran Sullivan, her riding instructor. “As a judge.” But she couldn’t breathe, her heart failed to pump enough blood to her brain and a sensation of heat that started at the place where his hand touched her back spread to her neck, trickled down her spine, across her belly and landed, softly, low in the cradle of her pelvis. She was certain that the source of this heat had nothing to do with waning hormones. “Do something for me, Katie.” His breath came in soft gasps against her ear. “Believe, even if it’s only for now, when I tell you that you are the most beautiful woman who walks the earth.” He brushed her lips with his. “Believe me,” he whispered and kissed her again, his mouth soft, warm, moist and wanting. And for that moment Kate did believe, while he tasted her, teased her with his tongue and lips. Kate Aiello, for the first time in half a century, made the conscious decision to believe that she was, for this unequivocal moment, the most beautiful woman on the planet.